Even going to an event like this, with over 60,000 people expected to attend over the four days, is kind of a big deal for me. I have anxiety disorder, and have >written about it several times, so going to a heavily attended event I’ve never been to before could have been a pretty big trigger in and of itself. Getting disoriented has, for me, the unfortunate status of being a trigger of anxiety and a result of it, and the Indiana Convention Center … well, it’s a pretty easy place to get spun around. I was saved, in a manner of speaking, by how busy I found myself once the doors opened and by how unbelievably friendly the environment was. When you’ve got 60,000 people all in one place because they love the same thing, the atmosphere is going to be welcoming no matter how anxious or shy you might be. (I did have one encounter that served as an exception; in the Rio Grande open gaming room, I went to ask an RG executive about a rules question, and when I introduced myself as a member of the press, he responded, “I can’t help you with review copies,” before I had a chance to even get my question out—and it wasn’t about review copies.) With so many game designers on the floor to talk about their games, I got just as caught up in the excitement of the event as anyone there just to play and buy games. I’ve been aware for a while that tabletop boardgaming was trending upward and drifting towards the mainstream; we saw it spoofed on Parks and Recreation with Cones of Dunshire and with Ben playing Settlers of Catan during his bachelor party, and you can walk into Target and find a dozen Eurogame titles there, with a couple of new games released exclusively to Target just this summer in a new Codenames expansion and the kids’ version of Ticket to Ride. 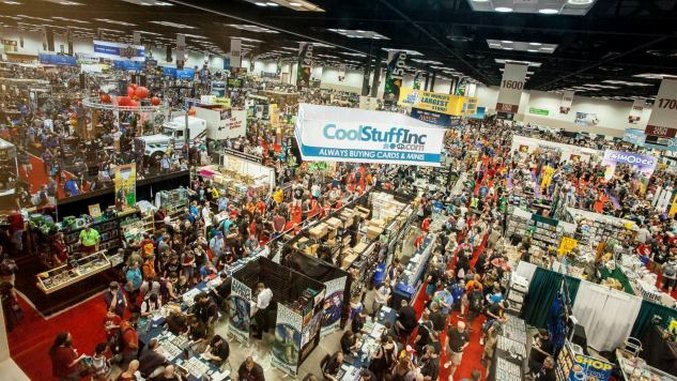 But seeing this many people in one spot, and the heavy sales of titles here that ran over $50 (some over $100), further validated that this space is exploding commercially in a way that will keep the new titles and creativity coming. Another sign of the same was the global trend of publishers spending more money on the look and feel of games, especially in the artwork. I saw several reissues (Medici, Citadels, Battle Line as Schotten Totten) that featured updated or wholly new art, and many of the more expensive games cost what they do because of the improved quality of the components. Even five years ago, games with great artwork or quality components were exceptional, typically coming from larger publishers like Days of Wonder or Fantasy Flight, but now it’s almost a requirement for games to have this, and it’s a leg up in Kickstarter efforts, which is how the majority of these games are getting their starts. One of the strongest manifestations of my anxiety disorder is the sense that everyone is looking at me—because something’s wrong. It doesn’t faze me when I’m on TV, or even when I’m speaking to a large group, but it happens when I’m in a crowd. Well, if you feel that way, come to Gen Con, because I can promise no one will be looking at you unless you want them to. For a convention that isn’t explicitly about cosplay there was no shortage of people in costumes, and I could only figure out what about half of them were supposed to be. I can’t imagine getting dressed up as any character on any day other than October 31st, but, hey, whatever finds your lost remote. Although I did get a lot of work done in terms of meeting publishers, exchanging contact info, getting demos, even attending a press-only event by Asmodee for a few of their newest titles (I played Inis and Legendary Inventors, both still unreleased), I wish I’d had more time to just sit down and play some familiar titles against other attendees. Nearly all of my plays were against the folks in the publishers’ booths, and I didn’t play anything that I hadn’t played before attending. If I’d gone for the full four days, I would have spent a full day just playing games between the giant exhibit hall (where you buy tickets to most games for a nominal fee) and some of the other free gaming rooms in the Convention Center or adjacent hotels. I did everything I intended to do and more, including meeting a few readers of mine along the way, but I missed out on some of the fun by packing my schedule full of meetings. Assuming I go back next year for Gen Con’s 50th anniversary, I’ll schedule more time for actual games … but I’ll leave my Harry Potter Halloween costume at home.